Discussion in 'Studio Scale Models' started by DaveG, Oct 19, 2011. 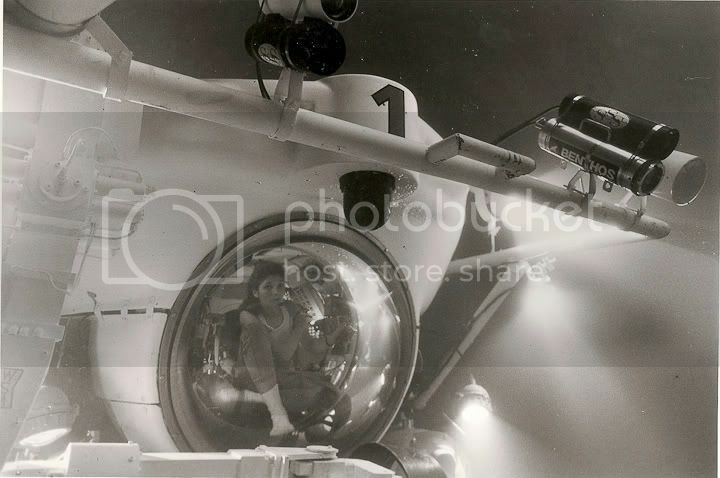 Back in 1988 I was hired by Dream Quest Images to supervise the model shop for Jim Cameron's The Abyss. 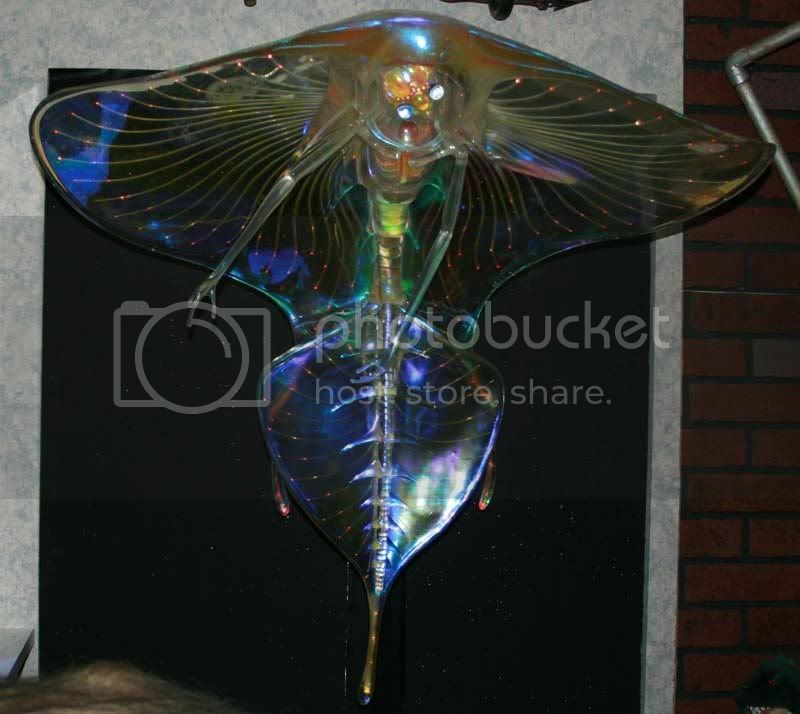 Over the course of more than a year I oversaw the fabrication and filming of dozens of models. 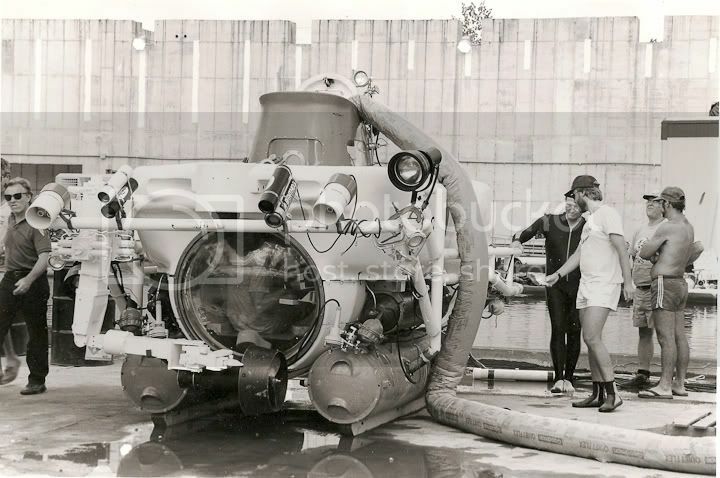 Among the most memorable of these were no doubt the 1/8 scale Cab and Flatbed submersibles. These highly detailed models were flown on wires dry-for-wet in heavy smoke to simulate the look of being underwater. They contained lights, batteries, motors and most notably, small computer controlled film projectors that could project images of the actors (shot previously in mockups of the sub's cockpits) on the inside of the model's domes so it looked like they were actually inside, controlling them. 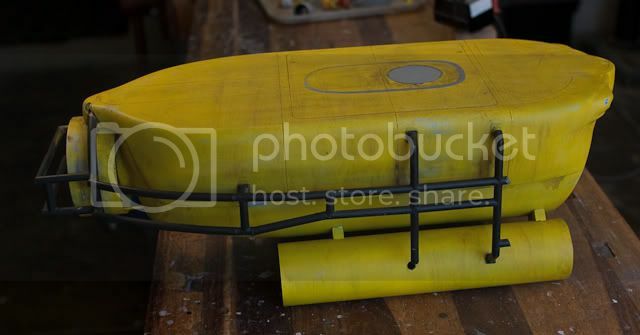 Lots and lots and LOTS of photographs of the full scale, 1/8 scale and 1/4 scale submersibles, both under construction and being filmed. A notebook containing all the visual effects shooting storyboards, miniature shot breakdowns, calendars and model lists. Stay tuned, this is gonna be fun! Oh man, I can't wait. I love this movie and you never see anything from it. Somebody mentioned Flatbed plans? :love I've got a copy. And I share. Let me know if you want a copy. I would happily commission you for all the submersibles. The 1/8 smaller guys and a reasonably massive deepcore as well. Please PM me if you'd like to chat about it. Thanks! this is one movie i cant wait to see on bluray! Sweet, Cant wait to see it. Here is a scan of a two page document that I wrote dated 8/1/88. This was before miniature photography began which was in early October, 1988. The list is reasonably comprehensive and accurate with a few exceptions. The original plan was to build only sections of Deepcore in 1/8 scale but it became obvious that to allow for flexibility in filming that we would need to build the entire thing. We built two identical, complete 1/8 scale Flatbed models as the schedule would require two stages to be filming Flatbed's scenes at the same time. Cab Three was repainted to be a second Cab One, and then back to Three again, at least once. Here is one of the original Cab Three models used in the film that is in the hands of a collector friend of mine. This model was complete at one time but took a fall off a high shelf during the 1994 Northridge earthquake and was busted up. After I completely document, measure, photograph and scan the model it will be restored to it's former glory. 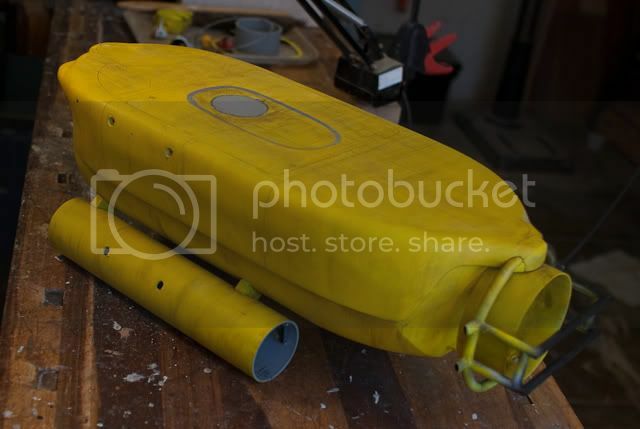 The hull and battery/ballast pontoons are completely intact with only a few cracks around the rear. In addition to the filming model, my friend had a number of extra parts, original patterns, drawings and artwork. 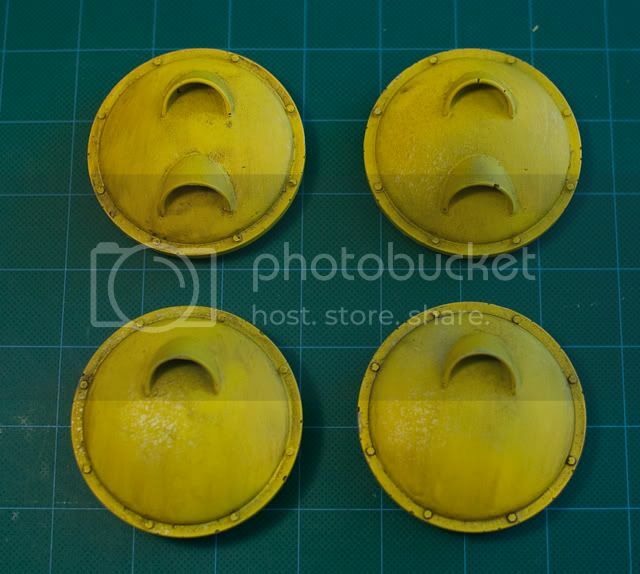 Here are the end caps for the pontoons along with the original patterns. 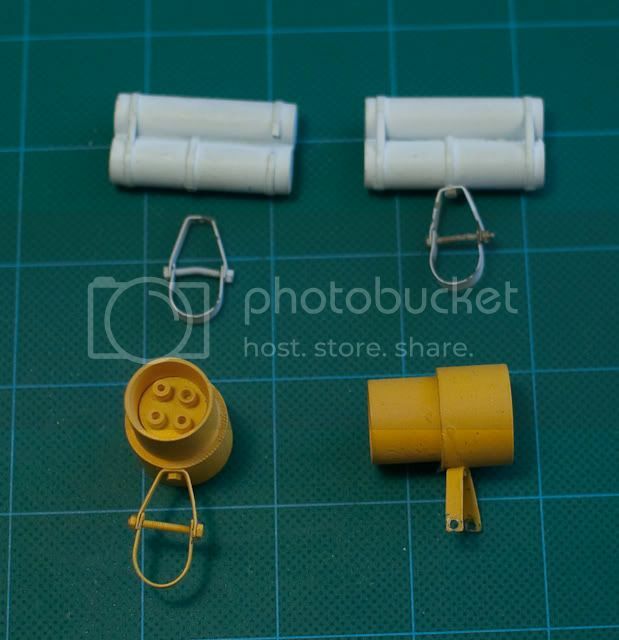 The pontoons held rechargable NiCad batteries to run the practical miniature lights on the model. Here are the crash rails which were broken off in the earthquake. 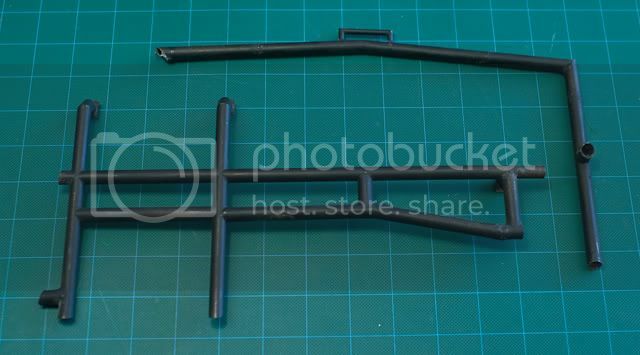 The rails were soldiered together out of brass tubing. 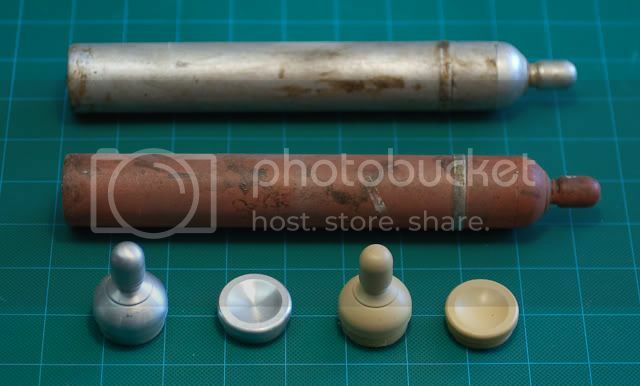 Here are some unfinished castings of the sail plus the finished part from the model. The next photo is of the "conning tower" and access hatch. 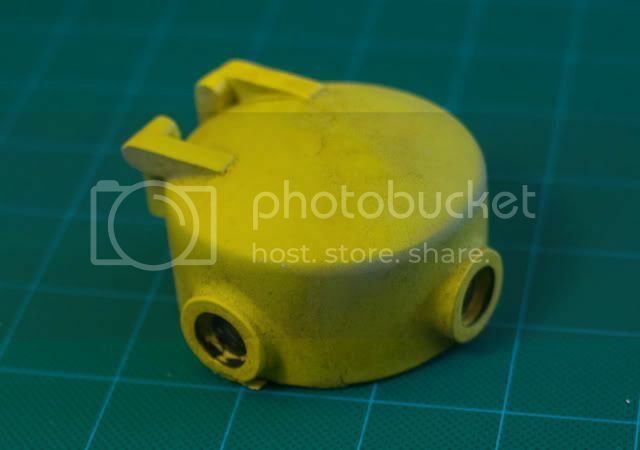 The front steering thruster from the model with an unfinished set of castings. The shape of the thruster varied a bit from the full size Cab but matched exactly the one used on the 1/4 scale RC models. A couple of oxygen tanks along with the original machined aluminum patterns and a set of castings. These castings were added to sections of Plastruct tubing to complete the finished tank. 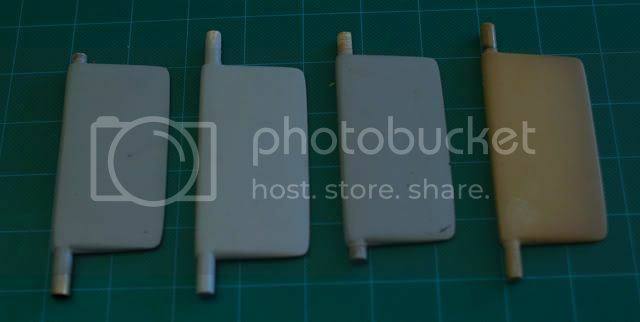 In addition to the Cab and Flatbed models, these tank castings were used extensively on the outside of the 1/8 scale Deepcore model, which accounts for the non-sub silver color of one. 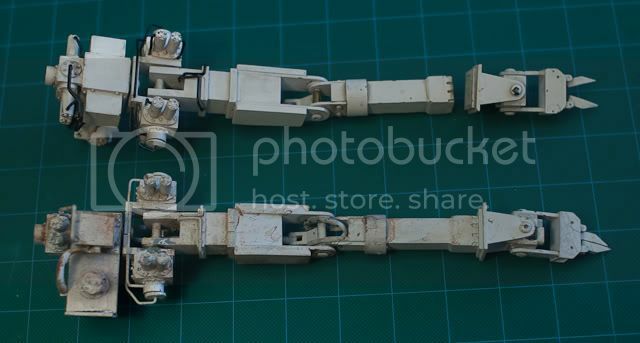 A pair of 1/8 scale manipulator arms. The full size arm was fully functional and provided by Western Space and Marine. In addition to the real arm, the production built several full size non-functional dummy arms to dress the full size Cabs and Flatbed. Two pair of steering vanes that went inside the large round cowling at the back ofthe model. The front domed viewport. 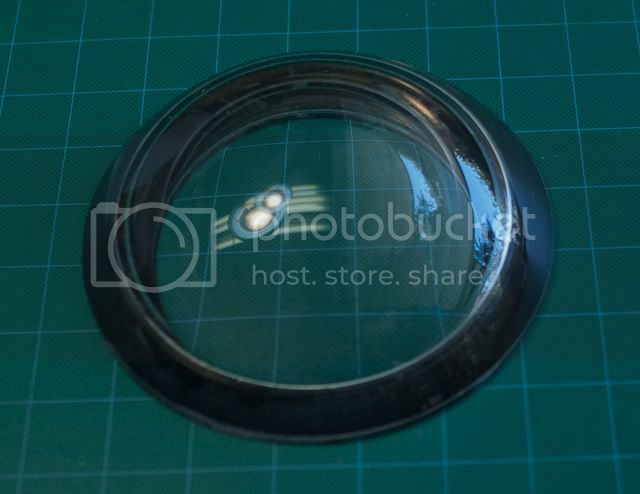 This part was created by glueing two non-concentric acrylic domes to a ring of plexiglass and then filling the space in between with mineral oil, which has the same index of refraction as glass. The end result mimicked the look of the lensing effect created when the real domes were underwater. After 23 years not a drop of oil has leaked from any of the four domes known to exist! 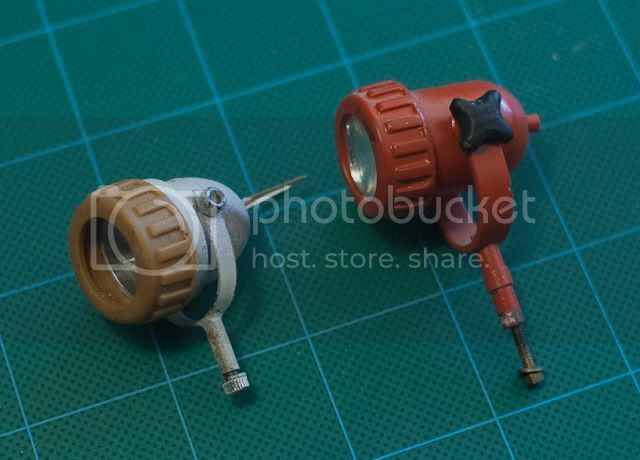 Here are some of the practical miniature lights used on the models along with replicas of some of the other equipment attached to the top rail on Cab. The larger lights used 12 volt MR12 halogen bulbs, the smaller lights were built around 3/4 inch diameter aluminum reflectors and 6 volt Carley lamps. 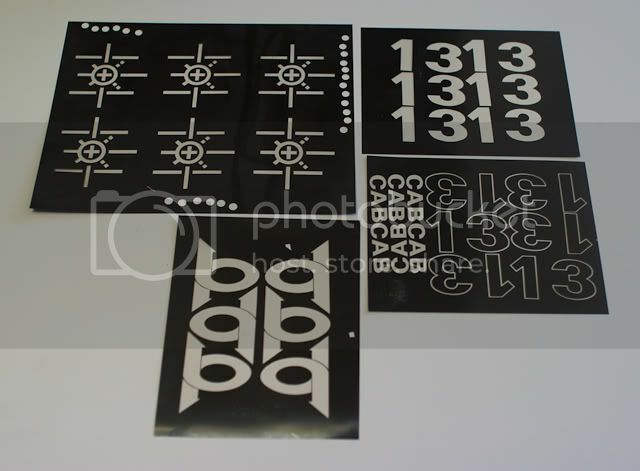 Here are the original litho negatives for the decals that were made. The bp logo stands for Benthic Petroleum. The fictitious oil company that owned the Deepcore rig. VFX Freak and SofaKing01 like this. 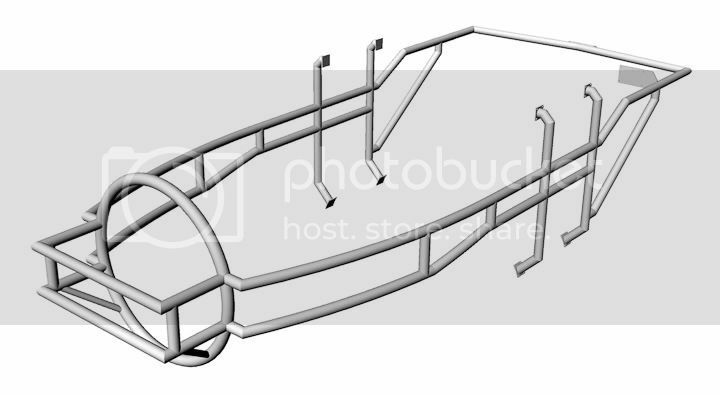 The first order of business is to thoroughly measure and scan the original parts and then create a virtual model in the computer. 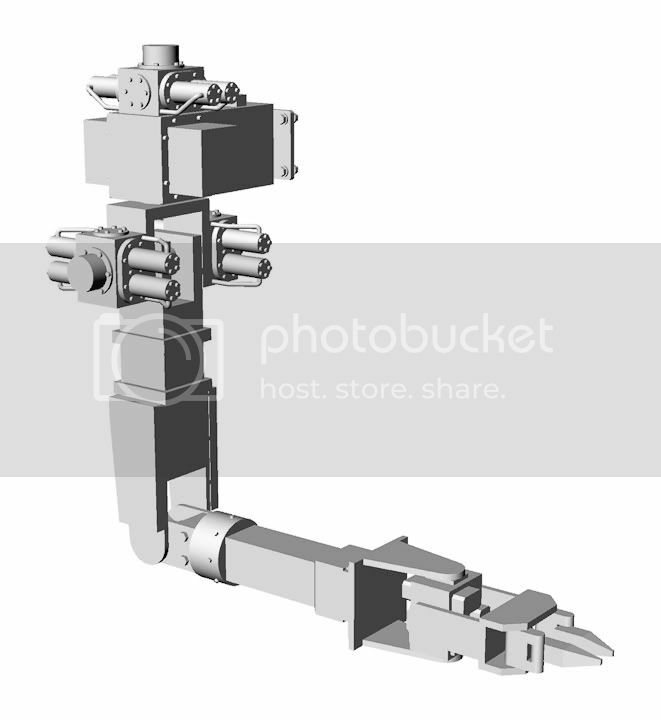 This model can then be used to create renderings, animation, drawings or new parts at any scale. 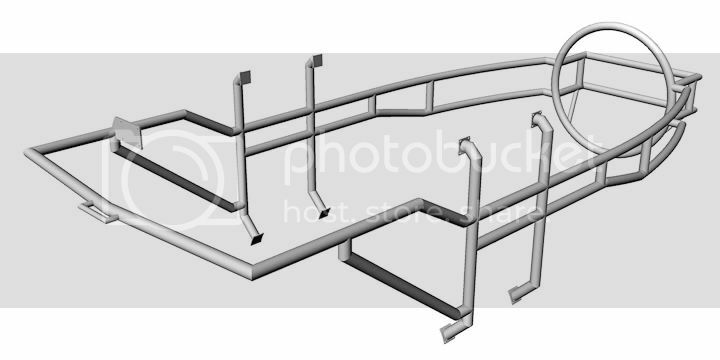 Here are the railings, reconstructed in the computer. 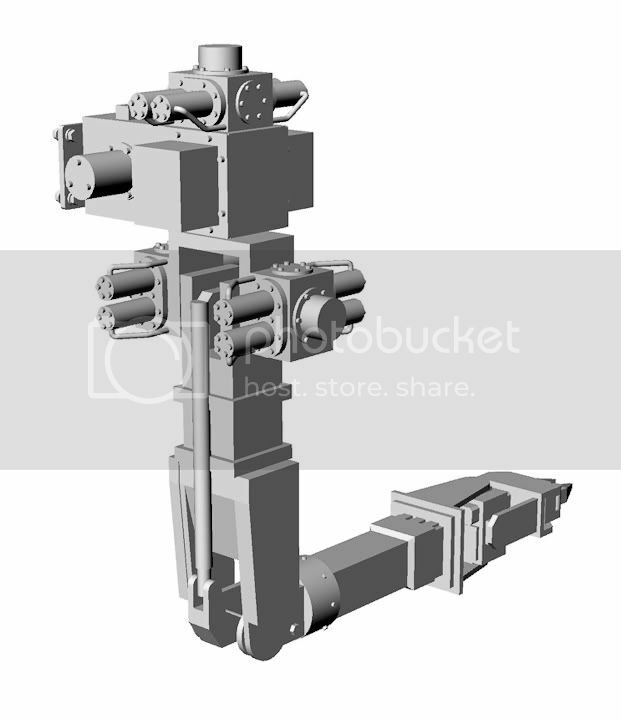 And a virtual model of the WSM Manipulator Arm, based on measurements of the model. keep this stuff coming... i would love to add a flatbed to the fleet. Amazing work. Not much else I can say or do except sit back and enjoy the show! 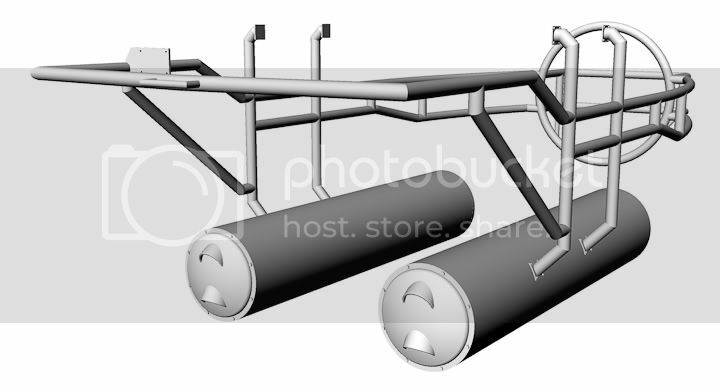 Here are the pontoons modeled in the computer. 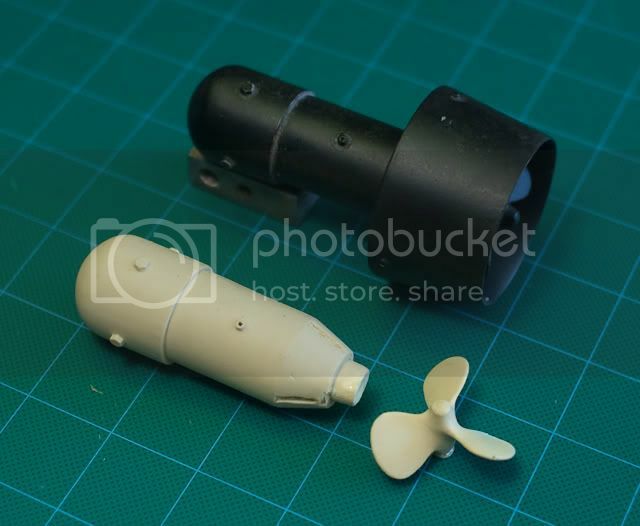 On the both the full size and miniature submersibles these housed the batteries. Not to highjack the thread but here's a cool piece I have. I wouldn't mind getting a copy, just for reference sake and inspiration. I'll hit the printers and ask how much for copies. Part Cast Exchange for the Green Leader Project!